Published in prestigious journals such as the Journal of the American Medical Association, dozens of randomized controlled studies clearly demonstrate that Posit Science’s brain training technologies are in a class of their own. These studies specifically focus on Posit Science’s technologies and on the measureable benefits they deliver for the average person, such as accelerated brain speed and sharpened mental acuity. Providing this level of proof is unique among brain fitness companies. 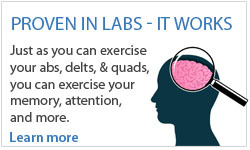 While other enterprises promote brain training products, few undergo the rigorous clinical testing that Posit Science bases their unique business model on. In fact, to this point, none have been subjected to the same degree of multiple, independent, peer-reviewed studies. Nevertheless, given Posit Science’s relentless pursuit for ever higher levels of refinements in its brain training programs, yet more studies are on the way. What matters most to researchers at Posit Science is the transferability of the cognitive gains made from the brain training programs to real world benefits for you. As such, these exercises don’t simply improve your ability to do the exercise, but instead they create ‘generalized’ conditions that result in specific cognitive gains applicable to your everyday life. In other words, you can think faster, focus better and remember more as you go about your daily routine. 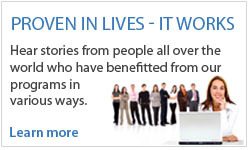 Learn more about our peer-reviewed published studies. Posit Science partners collaboratively with an extraordinary global team of more than 50 distinguished physicians and scientists from Harvard, Johns Hopkins, Stanford, Yale, Mayo Clinic, and other renowned institutions to design and test the brain training exercises. Learn more about Posit Science in-house science staff and Clinical Collaborators & University Partners. 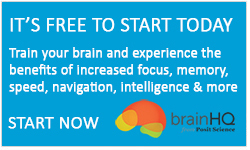 Using a breakthrough methodology for its brain fitness programs, BrainHQ exercises don't just simply drill memory or teach compensatory tricks. On the contrary, many of them target the critical roots of memory and thinking - the essence of the brain’s ability to absorb information from our eyes, ears and other peripheral senses. Discover more about our world-class patented design. Christiane can now keep up with conversations in crowds. Merry’s hearing is sharper and her memory more focused. Dave is a better competitive skier. Elaine started driving at night again. Discover their stories and others.